SNMP4J-Agent is a Java™ API on top of the core SNMP4J API for the development of SNMP agents (command responders). 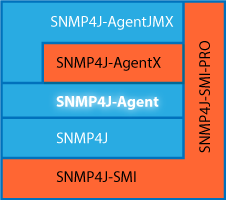 SNMP4J-Agent manages all the complex security and request processing. You just need to add your instrumentation code. Implementations for SNMP-TARGET-MIB, SNMP-NOTIFICATION-MIB, SNMP-PROXY-MIB, SNMP-FRAMEWORK-MIB, SNMPv2-MIB, SNMP-COMMUNITY-MIB, SNMP-USER-BASED-SM-MIB, SNMP-VIEW-BASED-ACM-MIB, NOTIFICATION-LOG-MIB, and SNMP-MPD-MIB, SNMP4J-PROXY-MIB, SNMP-TLS-TM-MIB, SNMP-TSM-MIB, SNMP-USM-DH-OBJECTS-MIB. SNMPv1,v2c,v3 multi-lingual agent support, including MD5 and SHA authentication as well as DES, 3DES and AES(128, 192, 256) privacy. IPv4 and IPv6 UDP, TCP, and TLS support. Transport Security Model (TSM) including Transport Layer Security Transport Mapping (TLSTM) as defined by RFC 5343, 5590, 5591, 5953. Datagram Transport Layer Security (DTLS) Transport Mapping (DTLSTM) as defined by RFC 5343, 5590, 5591, 5953. Java™ SE 9 or later, with module support. SNMP4J-Agent-DB add-on provides fast database/transactional persistence for MIB data. Overwrite (implement) a callback method for read (GET, GETNEXT, GETBULK) operations and for writeable objects one or more callback methods of the SNMP two-phase-commit. Add a query listener to the managed object server instance to update managed objects just before they are processed by the agent API to fulfill a request. Use a background thread to keep managed object values up-to-date. Implement database like interface to query values for large (virtual) tables and let the API cache tabular data for best retrieval performance (available with SNMP4J-AgentX).